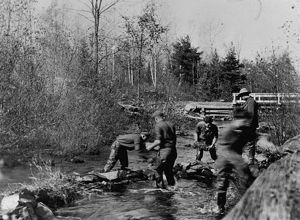 “The Legacy of the Civilian Conservation Corps in the Grayling Area” will be the topic of a presentation at 2 p.m. Sunday, March 7, at the Hartwick Pines Logging Museum in Grayling. Department of Natural Resources and Environment historian Rob Burg will present the program that highlights the work the Civilian Conservation Corps (CCC) did in Grayling, Gaylord, Houghton Lake, Kalkaska, Mio and Roscommon. The CCC planted more than 400 million trees in Michigan, fought thousands of forest fires across the country and developed some of America’s most beloved national parks. In the Grayling and surrounding areas alone, the CCC operated the Higgins Lake Nursery, built the Logging Museum at Hartwick Pines, the Conservation Training School (now the Ralph A. McMullan Center) at Higgins Lake, the Reedsburg Dam near Houghton Lake, operated the Grayling Fish Hatchery, and made improvements at the Grayling Winter Sports Park (Hanson Hills). This hour-long program will highlight these and other accomplishments of the “CCC Boys” during the Great Depression, when the CCC not only put men to work, but also helped to heal the state from the results of the lumber practices and wildfires of an earlier period. Michigan-and the entire United States-benefited from the work that “Roosevelt’s Tree Army” performed from 1933-1942. Hartwick Pines Logging Museum is part of the Michigan Historical Museum system. The Logging Museum is located at 4216 Ranger Rd. in Grayling. Admission to the event is free; however a motor vehicle permit is required for entry into the park. For more information about the museum, visit www.michigan.gov/loggingmuseum. Refreshments will be served. If you have any questions about this program or any other events at Hartwick Pines, please contact Rob Burg at (989) 348-2537 or by email at burgr@michigan.gov.